The Demand series is Definitive Technology’s latest and current top-tier bookshelf speaker line up. It consists of 3 models that vary slightly in size, power, and range, but otherwise have the same design. The one small exception is the smallest D7 uses a back facing port while the D9 and D11 are sealed with a passive bass radiator. The power and efficiency specs are decent but not extraordinary. This doesn’t necessarily mean bad sound, just that these will probably fare best in a near/mid-field setting, though the larger D11 could fare OK as standalone satellites in a full sized room. 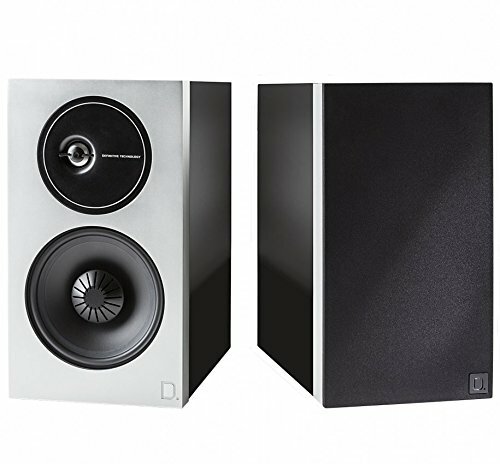 Definitive Technology speakers generally have comparatively strong bass and low response floors (the quoted figures in the product manual and their online product sheets are different for some reason), and with the sealed design with a passive radiator, the D9 and D11 could certainly be sufficient on their own, without a subwoofer. But, in general, 2 way bookshelf speakers aren’t really designed to reproduce the full range of bass and do best in conjunction with an external subwoofer. The tweeter is an embedded aluminum dome that is interestingly offset from the center which, according to them, improves center imaging, but how so isn’t exactly obvious. The woofer is a plastic blend which is a fairly common choice for all-purpose bookshelf speakers because its easy to consistently reproduce at lower cost. Paper/cloth drivers can perform better at close range, but are more prone to damage and general wear and tear. Definitive Technology has a 5 year warranty on all its passive speakers which is pretty top of the line coverage. The cabinet is standard MDF, but the baffle is actually aluminum as well. The chrome front contrasted with the black cones is an interesting inverted look that does look nice – Definitive Technology is definitely one of those companies that focuses on slick designs. Another neat little feature is magnetic covers that are easy as can be to take on and off. Reviewing and comparing higher end speakers is always trickier because the value isn’t always something that can be easily seen in the specs or design, yet listening tests are always individual and subjective. While we endorse Definitive Technology, and we do like and recommend many of their speakers, at the time of this writing its hard to recommend these Demand bookshelf speakers because they’re still quite expensive for what you get, even with subsequent MSRP discounts that we’ve seen. There are many comparable alternatives for a fraction of the price, money saved which could be spent on a nice subwoofer or receiver. Or you could opt for a nice 3-way tower speaker that is really designed to be a standalone speaker. Check out the links below for some recommendations.